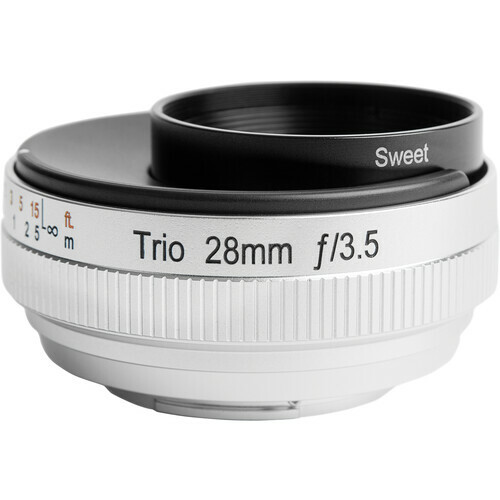 Don't waste time pulling a lens out of your bag or swapping optics with the Lensbaby Trio 28mm f/3.5 Lens. This pancake-style lens incorporates a rotating front that holds Twist, Velvet, and Sweet optics for selecting different effects at a moment's notice. The Twist uses a Petzval-inspired design for a sharp center area surrounded by a swirl of twisty bokeh. Velvet has a dreamy central area with a soft focus look along with a soft glow. Sweet creates a sharp spot of focus in the center with a gradual fall-off to blur. All these can be carried without stuffing your bag with a variety of miscellaneous equipment. Available here for Canon EF-M-mount cameras, the Trio will provide a 44.8mm equivalent focal length that offers a normal perspective for working in a wide variety of shooting scenarios. Also, it has a fixed f/3.5 optic that ensures predictable looks in a variety of situations. All the optics are multi-coated for minimal flare and ghosting and a manual focusing ring is included for focusing anywhere from 8" to infinity. Additionally, users can attach filters using the front 46mm thread for even more creative control. Works with APS-C cameras where the normal 44.8mm perspective that can be used to capture a variety of subjects, including street, portraits, landscapes, and more. Fixed f/3.5 aperture helps create a predictable effect in a wide range of situations. Rotating front dial with options for Twist, Velvet, and Sweet effects. Twist effect uses a Petzval-inspired design for a central area of sharp focus surrounded by a swirl of twisting bokeh. This optic utilizes four glass elements in three groups. Velvet effect creates a soft-focus effect with a dreamy center area with a delicate glow out to the edges. Sweet effect offers a central spot of sharp focus surrounding by a gradual increase in blur. Manual focusing ring that allows users to focus anywhere from 8" to infinity. Multi-coating minimizes ghosting and flare. Front filter thread of 46mm. Box Dimensions (LxWxH) 4.0 x 3.8 x 2.5"